Yesterday would have been Matisse’s 13th birthday. 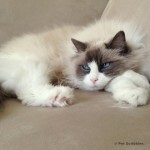 Matisse, or Mr. Boober as we affectionately called him, is our beloved Ragdoll cat who passed away almost 3 years ago. I miss that sweet boy so much. 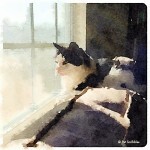 I wrote the following post in memory of Matisse on April 22, 2010 on the Pet Scribbles Facebook page. In honor of his memory, I’m sharing it here with you. I’ve added several pictures which, although all are not the best quality, will help to convey what a special cat Boober was. Our 10-year-old cat Matisse, as most of you know, passed away in November from cancer. Although we knew the day would come when we would have to say goodbye to him, it was still a very emotionally difficult experience. And 5 months later, I am still caught off guard by moments where I just miss him so much that I ache and I cry. But I have something to remember him by, that I could never have predicted. 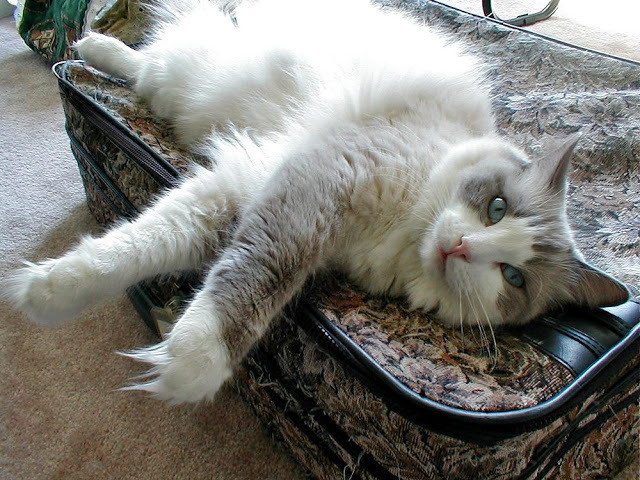 Boober was a gentle cat, a big giant mush of fluff, a true Ragdoll cat. He was gentle, he was loving, he was clown-ish, he was a Mama’s Boy. My husband and I often joked that if we could get Boober a tiny baseball hat to wear, it would have a pansy flower on it, because he seemed too timid at times. And then a few years ago Boober seemed to have a hairball issue – the darn thing just didn’t want to come out, or so it seemed. A trip to our vet changed our world, for Boober had a large tumor in his lungs. That’s why he had been coughing. It had to be removed, in order to not keep growing and suffocating him. The thought was that the removal would hopefully cure him. 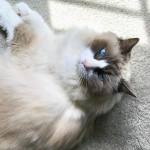 However, the tumor biopsy results showed that this tumor was instead a type of feline sarcoma that usually starts elsewhere in the body and shows up in the lungs as the final place. 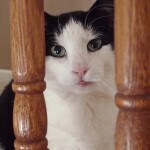 Boober was in a small minority of cats that have this sarcoma “start” in the lungs. No doubt there was cancer looming elsewhere in his body too. We were glad to remove the tumor, and so was Boober. After having to be quarantined away from the other cats while he recovered for 2 months, he was back to his old self in no time. (We gave him our guest room during the quarantine, and we took turns sleeping with him every night. We kept a pet gate in the open doorway, and the girls (Lulu, his little sis; and Aliza, his devoted companion) would stop by and chat with him thru the gate all the time. Aliza would actually sit at that gate almost 24/7 while Boober was quarantined. She loved him so much. We were told by all of the experts that he probably had about 3 to 6 months at the most. We opted not to do chemo on him. It wouldn’t have impacted the cancer, but it would have impacted his quality of life left to live, and we wanted him to live life to the fullest. Boober showed us that he was no pansy at all. He was with us for almost one-and-a-half years after the tumor was removed. He was seemingly healthy for most of that time. He wrestled with Lulu, and he groomed Aliza. He flopped belly-up to get tummy rubs from Dad, and he snuggled with me and also played our little game of hide and seek. In the final months, he went blind, first in one eye, then in both. The girls took turns helping him navigate around, and he never cried or complained. He leg muscles on one side atrophied, and he limped around, but never cried. He was no pansy at all. He was the bravest boy I’ve ever known. We had a few major snowstorms here over the winter, but each time, that pansy poked through the snow and survived. And kept blooming. And then in the springtime, just about a month ago, all sorts of pansies sprouted up – different from the ones we had just planted in another part of the garden. These pansies all sprouted up on their own (most likely from seeds from a previous year’s plantings). I call these pansies “The Boober Pansies” and every day I spend time looking at them, amazed at their strength. It is very hard to put this into words without crying all over again. I know this is part of the grieving process and part of the healing process too. My sweet Boober, that adorable Mama’s Boy, was no pansy at all. Or maybe he was. A strong one. It’s been over two years since I originally posted this on Facebook, and we still have “Boober pansies” popping up year-round. 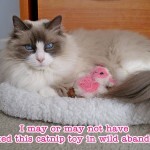 June 5, 2013 update – If you enjoyed this post, then click here to read a new post I wrote about Aliza, our formerly feral senior cat! Hi laura, this story of boober is so beautiful. Im sitting here crying my eyes out. 22 days ago we had to make the decision to put my belived 20 year old cat to sleep. This has been one of the hardest things ive ever done. I miss her so very much. She had kidney failure. But other than that, healthy as an ox. I know its hard for you too. Even with 3 years gone by. They are so special. Thank you for sharing this. Oh Gabbi, I’m so very sorry for your loss. 20 years must make it even harder for you. The decision you had to make IS one of the hardest we ever have to do. It is the one crappy thing about being owned and loved by a pet. (Yes, I think they adopt us, not the other way around!) But your decision is also the most selfless and loving choice you could make for your sweet girl. I’m sending you lots of heartfelt hugs and prayers during this difficult time. I remember this! And I’m so glad you shared it again. It was truly a message from Boober that his spirit goes on. Hi Bernadette, yes I’ll never forget that you offered me heartfelt words of support at the time that truly helped me. Please give each of your cats a little “scroochie” under their chin from me. Hugs to you. Girl you have me crying too! This is just another reason why we just may be twins separated at birth. I always say that we cannot judge our age in years but instead by the furry companions we have loved and lost (I am 3 cats old). I am not surprised that Boober sent you a sign of his love that brought you some semblance of peace in knowing that he is still with you always even if it is in spirit. My husband and I lost our cat of 20 years last year and as always it was like a knife to the heart and we cried for days. A few months after he passed and the weather got warmer my husband noticed a butterfly frequenting our porch. We didn’t think anything of it at first but as the weeks went by the butterfly continued to show up EVERY day. He became super friendly and would land on my husbands finger and even let him kiss him. We named him Spot because he had a white spot on his wing (our cat was a white version of Boober). Spot visited every day for 4 months…that was my sign…thank you so much for sharing yours. Such a Beautiful story…this should be in Chicken Soup for the Cat Lover’s Soul 2! I’m glad you have the Boober Pansies to remind you of your sweet kitty. Thank you for sharing such a beautiful story! Me too, Steph! I hope those pansies stick around forever and a day. What a beautiful cat!! Thanks for sharing. Thank you Niki! Yes, my sweet boy was ever so special to me! Laura, I love this tribute. Our pets really are a part of our family!! We have a 10 year old lab who had a tumor removed in July and we are thankful for every additional day we get. They bring so much love into our lives it is truly immeasurable. I am so sorry for your loss, even 3 years later, I’m sure it feels like yesterday. Oh Karah, I know exactly how you felt once that darn tumor was removed: pure relief! I hope and pray you have many beautiful days ahead with your lab – they are such wonderful dogs! I think for pets, in general, it is the unconditional love they give that makes their loss so difficult. Oh my…what a bittersweet story! I am so sorry that you lost your dear Boober. I have a sweet Kitty that I love so much also, his name is Chopper and he is 10 years old. I don’t even like to think of him getting sick or passing away! Thank-you for sharing this Laura! Your cat was gorgeous. I will be honest. I looked at the pictures, but I couldn’t bare to read… I’m a total “pansy”. I have two cats and have lost a few over the years 🙁 So sorry for your loss. I really am. Thanks Shannon, for the compliment and sympathy about my sweet boy. I’m sorry you’ve also had to experience the difficulty of saying goodbye to cherished pets. I hope their memories remain vivid in your heart. Give your cats some hugs from me!